The CPRR Museum is not aware of having any 1870's oyster car photographs. "First car of oysters on an Empire Line refrigerator car came through on a passenger train bound for San Francisco." This may be a paraphrase. I am unfamiliar with the Empire Line. ... I'm wondering what significance the Fast Freight designation has. Is this just an early name for "express" service? Yes, these were express services, often desirable because of the specialized cars they could provide. I found the following very interesting piece of the origins of the Empire Line. It raises the image of oysters being shipped in barrels, although fails to show a photograph of a "rack car." Perhaps other members of the CP Discussion Group have East Coast contacts that could help us with this. John H. White, Jr., The American Railroad Freight Car (John Hopkins University Press, Baltimore, 1993), pp. 378-379. In the early years oil was shipped in barrels, not in tank cars – so that would be the rack cars referred to. Tank cars started coming in in the late 1860s, but rack cars for barrels continued in use a lot later. But I think this is not all the story – I'm pretty sure there was an Empire Fast Freight Line much later than 1877. Perhaps the company was split, with Empire Transportation going to Union Tank Line (an acquisition which I have also found other reference to in the past – and photos of Empire Line tank cars), but with the Empire Fast Freight Line continuing separately as an affiliate of the Pennsy. Besides, the Sacramento Union article specifically mentions the oysters arrived in an Empire Line reefer. Excellent source information on the scope of the east coast oyster imports ( sorry no rail car pictures ) is found in U.S. Commission of Fish and Fisheries, Part XVI, Report of the Commissioner for 1888 Pages 153 -155. Author is J.W. Collins- Govt. Printing Office 1892. 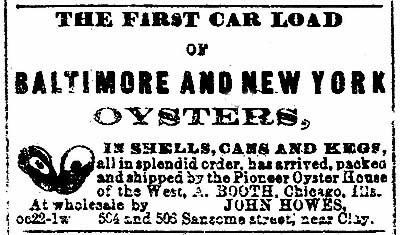 To quote Collins-" soon after direct rail communication with the east, about 1869, the firm of A. Booth & Co. brought to San Francisco three carloads of live Eastern oysters of large size "( My paragphrase here- market wouldn't buy them all- so to avoid loss- planted in S.F. Bay- oysters thrived- opportunity seen ) " The following year seed oysters were imported from the east and oyster beds were started on a commercial basis. About 1871 Booth & Co. sold out their interest to Morgan Oyster Co which largely increased the business". ( My paraphrase here- seed oysters shipped in spring & fall- transportd by the carload on freight trains- usually 3 weeks on the road- in favorable weather very small loss of oysters- 85 to 95 barrels shipped per rail car, no ice in barrel itself. One barrel holds 4,000 to 8,000 seed oysters. Cost per barrel in New York is $3.50. Freight fluctuated- $400 to $500 per rail car. In Largest year 120 carloads shipped, average from 1878 to 1888 was 100 carloads. Many thanks, Ron. I'll be interested to learn more about the oyster business. Booth and Company was a commercial merchant firm based in San Francisco and Sacramento dating back into the 1850s. They were also active in fruit export from California to the East. The definitive work on the California oyster business – in my opinion – was done in 1963 as a Cal. Berkeley thesis by Elinore Barrett. Thanks to the web and digitization by the University on a site called Calisphere – her entire oyster thesis is now viewable on line. Her work is footnoted throughout referencing her source documents. I have found by reading a good many of the source documents that she was indeed an impeccable scholar. To get an idea of what sprang from those "excess" oysters that weren't initially sold and instead planted in the bay, see the [above images]. Thanks! This reference source made for a very informative read – a well-rounded history of the San Francisco Bay oyster industry. 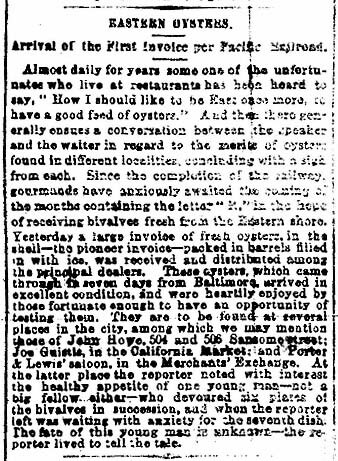 Attached find scans of a newspaper article and advertisement – from the October 22, 1869, issue of Daily Alta California (five months post-golden spike) – announcing the arrival of the first shipment of oysters to San Francisco from the east via the transcontinental railroad. Thanks again for all the great information you all have provided on this subject. ... The only thing I can't be sure about is the name 'Guistie'. I'm pretty sure the penultimate letter is an 'i', though it may be an 'l', ... and the final letter could be an 'e' or a 'c'. The name 'Howes' appears in the advertisement that I sent accompanying this article, so, presuming it was correctly spelled in the ad, then in all likelihood the author of this article misspelled his name here (leaving out the final letter 's'). On the earlier discussion of the Empire Line, I checked the August 1888 edition of the Railway Equipment Register. The Empire Line is listed with a lot of cars – mostly box cars, but also about 50 refrigerator cars (32 feet long), and a bunch of rack cars. There are a number of participating railroads, notably including the Pennsylvania, Delawre & Hudson, Lackawanna, Erie, Lehigh Valley, Philadelphia & Reading, Rock Island, Minneapolis & St Louis, and others. This entry is, of course, nearly 20 years after that first batch of oysters arrived in California in an Empre Line refrigerator car. Among the early refrigerator car designs patented were those by LeGrand Kniffen of Worchester, Mass, in 1867 (pat #69223), J. B. Sutherland of Detroit in 1867 (pat #71423), William Davis of Detroit in 1868 (pat #78932, reissue #3119), Theodore Hyatt of New York in 1870 (pat #101879), Alfred Booth of Chicago in 1870 (pat #107217) – Central Pacific built some, William Philips of Elmwood, Ill, in 1870 (pat #107716), and the jackpot – Joseph Potts of Philadelphia and Benjamin Lamason of Milton, Pa, in 1870 (pat #104765) with patent assigned to the Empire Transportation Co. I bet that is what the oysters came out in. Milton was the site of an important car building firm, the Milton Car Works of Murray, Dougal and Company, known especially for tank cars, later part of American Car & Foundry, and still building tank cars today. Lamason was associated with the company in the 1860s and 70s. ... It's really impressive how you guys dig up all this stuff. The drawings associated with the patents are interesting, though they wouldn't likely be useful for illustrating the film. I did find an 1897 photo of a Pullman-built oyster car that plied the Port Arthur, TX - Kansas City trade [above]. 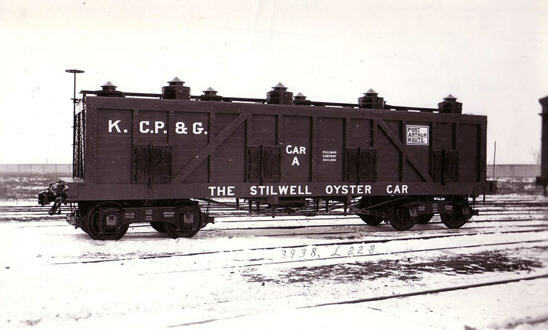 The interesting thing about it to me is the reference on the side to "The Stilwell Oyster Car." Stilwell (sometimes spelled Stillwell), was also the middle name of the owner of the Morgan Oyster Company, John Stilwell Morgan. Now I'm wondering if there might be some familial connection between him and Arthur E. Stilwell, the designer of the Pullman oyster car. I would be most interested in seeing any such shipping documents that may have survived in an archive/library. The two primary company names are J.& J. Ellsworth of New York (the shipper), and the Morgan Oyster Company of San Francisco as the receiving party. We have a typescript of an oral history dictation completed in 1888 by John Stillwell Morgan, owner of Morgan Oyster. I'll try to have a look at it next week, however it does not seem to be something that would contain anything like shipping documents. There were numerous fires that consumed significant portions of San Francisco in the 19th century. If such papers somehow survived those firestorms, there's a good chance they eventually perished in the 1906 conflagration. But I will certainly keep an eye out for them in the course of my work on this film project. BOOK: The Oyster Industry by E Ingersoll, 1881. Thanks for this. You railroad guys are really into this stuff! It's fantastic that you all are keeping the history alive. I'm duly impressed. The use of fish cars was rather more widespread than one might expect. The federal government had some, possibly under the Dept of Agriculture, and they put out a booklet called The Fish Car Era, ... A variety of states had similar cars as did the Shedd Aquarium in Chicago, and their last car is in Montecello, IL. ... The booklet on these cars was published by the Department of the Interior, U.S. Fish and Wildlife Service, in 1979. Its story starts in 1872 with the set-up of the U.S. Fish Commission under the Dept of Commerce. Fish were first shipped by train in milk cans with an attendant going with them in 1874. The first purpose built car was ordered in 1881. Car #2 came in 1882, #3 in 1884, and #4 in 1893. The first steel car was #7, in 1916. The last was #10 in 1929. By 1940 only three were operating, and one was wrecked in 1944. The last was taken out of service in 1947. And this only talks about Federal cars, with state and aquarium cars also operating during this period and beyond. Title: THE FISH WHO RODE THE RAILS. Michigan's Oden State Fish Hatchery, near Petoskey, Michigan, has a full-size replica of one of these cars on display to the public, in case you ever happen to drive through the northern extremity of lower Michigan. Be sure to check Mid-Continent Railroad Museum at North Freedom, WI. They have a restored fish car dating from the Wisconsin Game and Fish Department days. For the Michiganders and Michigeese among us, the Oden State Fish Hatchery, near Petoskey, has a replica of one of the state wildlife department's fish cars. The Wisconsin Fish Car is at Mid-Continent Railway Museum in North Freedom, Wisconsin.